A newspaper article from 1904 describing the new Wesleyan Methodist Church, St.Annes. NEW WESLEYAN CHURCH FOR ST.ANNES. Saturday, April 16th, 1904, will mark a new epoch in the history of St. Annes Methodism. On that day the foundation stones of the new church in Church Road, will be laid. A short service will be held in the Drive Church, at 2-30, and the take placef laying the stones will take place at 3-30. 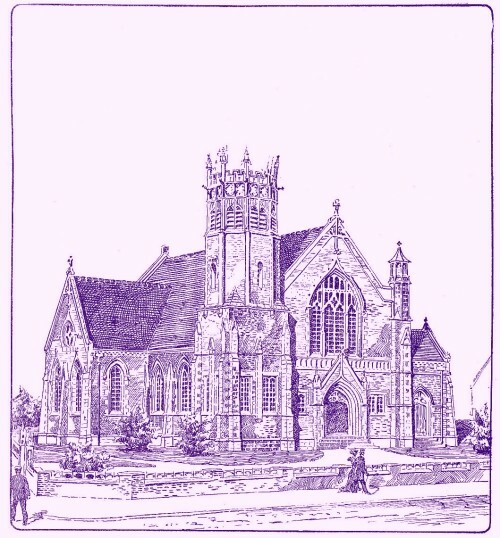 The proposed church, of which we give an illustration, was designed by Messrs. H. and W. Wade, of Bank Chambers, St. Annes, and 27, Birley Street, Blackpool, whose design was selected in a limited competition. As our readers may judge the edifice will be an imposing one, having a frontage to Church Road and St. Alban's Road. The style adopted is the late Gothic. The plan consists of nave, chancel and transepts, together with a gallery, and the church will accommodate, when completed, 750 persons. An octagonal tower is a prominent feature of the design. It will rise to a height of 72 feet and be finished with louvred openings, battlemented parapet, and pinnacles. The length of nave will be 70 feet, and the width 40 feet. The transepts will be 15 feet deep., The size of the chancel in which the choir will be placed will be 22 feet by 17 feet. There will be three entrances : two in Church Road, and one in St Alban's Road. In each case there will be two swing doors, in addition to the external doors, between the interior of the church and the outside, to check all draughts and exclude noise. The vestibule will be 9 feet wide ; and the minister's vestry, 14 feet by 12 feet ; the choir vestry 16 feet by 13 feet, and each will have all requisite conveniences. The organ chamber will be 12 feet wide and 17 feet in length. The height of the main body of the church from floor to eaves level will be 28 feet, and from floor to ceiling line, 39 feet. used, externally, will be parpoints with Nelson stone dressings throughout ; and internally, the walls will be faced with plaster, and with cement dados. The roof will be covered with Buttermere green slates. The whole of the internal wood work will be of pitch pine (not varnished but coated with linseed oil). The organ case and panellin will be of oak. The aisles, chancel an vestibule will be of oak blocks in concrete and the porches of Mosaic tiling. The roof will be of the partially open timber type The pulpit will be of oak, and the communion rail of the same timber with specially designed wrought iron standard The glazing throughout will be lead lights. A dwarf boundary wall will surround the structure, with a light wrought iron railing. The floor will fall 18 inches from the entrance to the chancel. Special attention is being paid to the acoustic properties, ventilation and heating—the latter on the low pressure principle. The church will be lighted throughout by electricity. The total cost of the building is estimated to be £5,000, and it is expected that the church will be completed by September 1905. The contractors are Messrs Butterworth & Sons, Ltd., of Blackpool.